Thank you, Mr President, for allowing me the opportunity to speak to members of the Royal Selangor Club about what lies ahead for the country. I was once a member of this special Club. I have fond memories of the Long Bar as a special meeting place for lawyers and businessmen, where good spirits and conversation could always be found. Today we have a Prime Minister who is not only embroiled in a financial scandal the magnitude of which the world has not seen before – he has also deliberately obstructed the machinery of Government from carrying out its duties. The Government of Malaysia is today run by Prime Minister Najib Razak’s lackeys, and he himself has become dangerous as a leader of this nation. From what we have seen so far, there appears to be nothing stopping him from doing whatever he believes will preserve his power – and that includes the possibility of ruling by martial law. What lies ahead? Dark clouds and uncertain times. Democracy and a fair, just and responsible government are in jeopardy. Unbridled extremism from both sides of the political divide will reign. 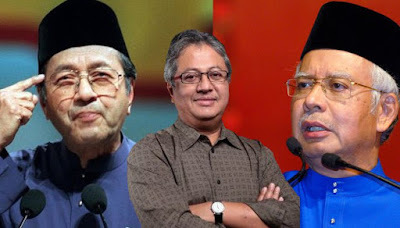 Malay extremists will continue to blame Chinese Malaysians and various foreigners for everything that has gone wrong, while the angry “reformists” from the Opposition will blame everything on UMNO and Dr Mahathir Mohammad. The room for sensible political engagement is almost closed. The “you are with me or you are against me” syndrome is now very much alive. I fear that more of this lies ahead. A nation can be destroyed in a short time. Rwanda was destroyed in a space of only a year of ethnic violence between Hutus and Tutsis. A million Rwandans died for little more than to showcase the politics of hate and the power of violence. It took Hitler just seven years from 1928 to ascend to absolute power and change the worldview of Germany, such that an entire people could believe that they might rule the world by conquest and close an eye to the mass murder of the Jews. It took a World War to end the political disease and hegemony of the Third Reich. In Malaysia today, we have Najib who has been in power for six years. He will not follow the law other than to use it for his own purposes, and the longer he rules the worse our future will be. We must therefore act and do our bit. His removal must be our common priority. I repeat: his removal is our priority. To do this there is only one option available: either we rally behind Dr Mahathir, or we have to live with Najib for a long time. If we have to work with a group within UMNO to remove Najib, then we must. I know some of you are allergic to Dr Mahathir, and some of you are more gung-ho and believe that we must remove UMNO altogether. If you can do it, then by all means do it. But I would rather try to remove Najib first, simply because, on paper, it’s easier to achieve. Change comes in small doses. In the past, Opposition parties have become stronger only when breakaway factions formed in UMNO. The first UMNO breakaway was led by Tengku Razaleigh Hamzah in 1988, which helped PAS gain control of Kelantan. The second UMNO breakaway was led by Anwar Ibrahim in 1998, which helped plant the seeds of Pakatan’s present strength. These two movements did not change the Government. However, victory may come if there is third UMNO breakaway that is prepared to work with the Opposition. The question is whether the Opposition is willing to work with UMNO breakaway faction Number 3 and vice versa. This is a big “if”, but it’s possible. First, we need to recognise that within the reformist group there are two main types of people. The first consists of sensible and serious Malaysians who want to see no chaos but a peaceful transformation in our system of government. They see Najib as the country’s biggest curse. They want to see workable change where the Government is led by Ministers who have ability and integrity. They want public institutions to provide good governance for the people. The second type of reformists are always angry, who write regularly to Malaysiakini about the fault of UMNO and Malays generally. They have a deep-seated anger about the New Economic Policy and about Malay dominance in government. They are angry about almost everything to do with UMNO Malays. Everyone whom they disapprove of is an UMNO stooge. These people even questioned if I had an ulterior motive when I participated in Bersih. Only they have noble intentions. The only way we can remove Najib, if at all, is to mobilise the nation. For this, we need a leader. You may want this person or that person, but I tell you there is only one Malay warrior left who is able and willing. Let me explain why this is important: we can have meaningful change in this country only when Malays accept those changes. Malays will change only if Malay leaders they trust tell them to do so. We have so few brave and progressive Malay leaders to start with, so reformists and the Opposition must learn to trust the leaders we have. Here, I urge all Malaysians especially Malays to rally behind Dr Mahathir. He is the only one who dares, who has courage and—I assure you—he has the country at heart. When Dr Mahathir attended Bersih 4, some NGO and opposition political leaders talked incessantly about not forgetting his past sins. Some said he was responsible for everything that was wrong in the country. There were even those who accused him of trying to “redeem” himself by latching onto Bersih. That’s not the way to treat a Malay leader of his stature. Someone like me, who represents no one, and who speaks for no one, can be ignored, but Dr Mahathir—even at this late stage in his life—is still making an effort to change the country for the better and he has a lot of support. Should we not be generous with him in our words and judgement? Should we not make a special effort to include him in the things we do to make change possible, especially as he is still able and willing? After all, we have forgiven Anwar and embraced him as our new hero even though he was Dr Mahathir’s deputy for many years. If we can forgive Anwar for the use of the ISA, for Operasi Lalang, for the Sabah IC scandal, for the sacking of judges, for Islamisation in our schools—all because Anwar is now on our side—can’t we also give Dr Mahathir an ounce of kindness? I do not want to talk about the past because the past is done and dusted. Instead, I am trying to offer a solution for the future. The Opposition, the reformists and civil society leaders must give Malay leaders who are fighting for change the consideration they deserve. The Opposition must, for the greater good, work with Dr Mahathir while he is still strong. It is pointless to rue the lack of Malay support for Bersih 4 when that could have been easily overcome by treating Malay leaders with more respect. For example, it was arrogant to say that Dr Mahathir was responsible for everything wrong with our country. Many Malays like me remember him for how he successfully developed the country and for his master plan as outlined in Vision 2020. Furthermore, no Malay leader rejected theocracy as firmly as Dr Mahathir when he said that hudud had no place in our country. No other Malay leader had the strength and conviction to make peace with Chin Peng in 1989 so that all Malaysians could forget the past and live peacefully in the future. No Malay leader had the trust of the Malays to be able to remove personal immunity from the Malay Rulers, but Dr Mahathir did just that for the good of the nation. No Malay leader has built more infrastructure in this country than he has. I could go on and on but I am not here to promote Dr Mahathir. I am here to remind you that political change in Malaysia requires Malays to accept change; and Malays will accept change only if the Malay leaders they respect tell them to do so. If Malays have fears, no matter how unjustified, they will only be able to overcome those fears and become brave if Malay leaders tell them to do so. That is the cold, hard truth. Therefore, we cannot let personal feelings obstruct our greater purpose. "The Government of Malaysia is today run by Prime Minister Najib Razak’s lackeys, and he himself has become dangerous as a leader of this nation. From what we have seen so far, there appears to be nothing stopping him from doing whatever he believes will preserve his power – and that includes the possibility of ruling by martial law. What lies ahead? Dark clouds and uncertain times. Democracy and a fair, just and responsible government are in jeopardy. " The AG was fired from his job just before he was completing what would have closed this sorry saga. He was replaced with another person and Najib is still in power. The next big step is going to be the Vote of No Confidence by the Members of Parliament. I hope it is being organised. How can Najib stop a Vote of No Confidence? Zaid Ibrahim says Najib will go to the extent of declaring martial law to preserve his power. Zaid is just thinking aloud. Thinking is still allowed in this country. Except when it comes to discussing religion, because as you may know one mufti has said that you cannot use intellect and logic to discuss religion. Oh well. Coming back to martial law, may I strongly advise Najib and any crooks who have the same ideas to not even think for one minute about martial law, suspending democracy, suspending Parliament, declare an Emergency or any such dumb thing. Thus far the PM has exhibited exceptional incompetence and stupidity but suspending democracy would be the ultimate 'thorn of crowns' on his brainless head. However I hope that the people will take note of what Zaid Ibrahim has said. The easiest and cheapest way to thwart these things from happening is to start discussing this in our society. Lets get the discussion going. To the Media, you have a large role to play. Start asking the Ministers, the gomen and Najib if possible if there is any possibility that they are considering the declaration of an Emergency or martial law for any reason at all. Ask them what would be the reasons (if any) for them to start considering the declaration of martial law, an Emergency, suspending Parliament, rule by decree etc etc. Tell them that the people (or at least Zaid Ibrahim) are worried about this possibility and ask them for their comments. Lets see what they say.